Faculty, staff and students may witness a response by University Police to a situation requiring police presence within your building. In the event of a building-wide emergency, Police Officers may direct you to either stay in your office or classroom, not enter the building, or to leave the building immediately. If you are contacted by a police officer, ALWAYS follow their instructions, as you may not know the reason that an officer is giving you instructions, or what danger(s) may exist. 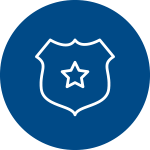 Failure to follow officer instructions could endanger your life as well as the lives of others, and could lead to your arrest for failing to comply with the officers' instructions. Do not run from a police officer when contacted or instructed in any way. This could lead to injury to you or others, or enforcement action being initiated against you. Use the “Neutral Question Position”– hands forward and palms up like asking a question – when confronted by officers. This allows them to see your hands and scan quickly for weapons (they don’t know you’re not the “bad guy” until they identify you). Some buildings contain security or life and safety alarm systems that when activated, in most cases, require Police response. Until the alarm is proven to be false, police respond as if there is an actual intrusion, or emergency. Even if you know the alarm to be false, you must STILL follow all instructions from responding police officers as well as any protocols that have been established for an alarming system within your building. In any event where University Police have been dispatched to your building, the Police will follow up by contacting responsible parties within the affected building to explain the response, even in the event of a false alarm. Those contacted may include department head(s), dean(s), or building coordinators who will then be responsible in determining who/when to distribute information regarding the police response to a given situation. It will be the responsibility of each building to provide 24/7 contact information for those responsible parties to the Police Department, as well as update that information as necessary.